True chocolate lovers only need one thing for dessert: chocolate! That's all you need to make this super-easy chocolate fondue. Serve chocolate with assorted dippers, such as JET-PUFFED Marshmallows, pound cake cubes, OREO Cookies, strawberries, peeled kiwi slices, orange wedges, apple slices, maraschino cherries, candy canes or pretzel rods. 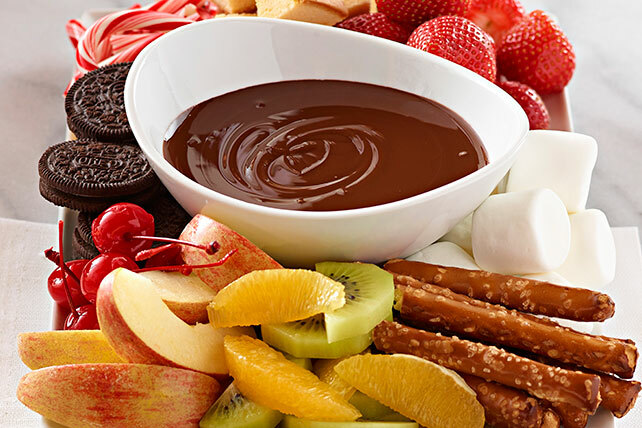 Enjoy a serving, 2 Tbsp., of this rich and indulgent fondue on special occasions. Stir 1 tsp. ground cinnamon and 1/8 tsp. ground red pepper (cayenne) into chocolate before melting. Choose 1 of the following flavor options: Chocolate-Peppermint: Stir 1/2 tsp. peppermint extract into melted chocolate. Chocolate-Almond: Stir 1/4 tsp. almond extract into melted chocolate. Chocolate-Orange: Stir 1-1/2 tsp. orange zest and 2 Tbsp. orange-flavored liqueur or orange juice into melted chocolate.